One thing is for certain - while the patterns for these competitions are not always the type of design I would choose for myself, I definitely learn something from each one. I have made it up past the cuffs and through the first pattern repeat of my Out of Town in London Fog Socks... and haven't managed to tangle my yarn or contort my circulars in too many nasty ways. One thing is certain of the 2-at-a-time magic loop technique - it is very fiddly to get started, but not that bad once the tube is established for each sock. I found the first half-dozen rows it felt like the tube was twisting, and I had to really try hard not to accidentally "mobius" the cuff. After a dozen rows though, it was easy to see where I was at all times, and I was learning how to place my needles for the most comfortable knitting position. 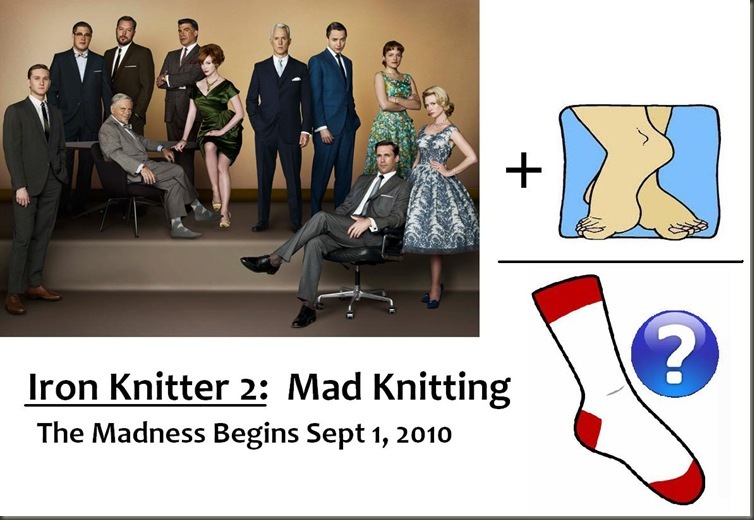 Iron Knitter 2: Mad Knitting has begun... after a slight delay in the clue-solving (thank you Team Canada for being smarter than I and figuring it out in time!) my socks are cast on, and the ribbing is mostly complete. 90% of the knitters who complete this design will progress on to round 2, so I have to knit quickly, but really don't need to kill myself at it for this round. I have no problems churning out a pair of socks in a weekend, and the deadline for this round is Sept 17th. I decided to challenge myself a little here - I'm working this pair 2-at-a-time on circulars - my first time using this technique. I hear that it's a great way to work a pair of socks quickly, especially since there is less counting and record-keeping. Because both socks are worked at the same time, when you complete a section (ribbing, leg, heels, toes) you are completely done of that section. 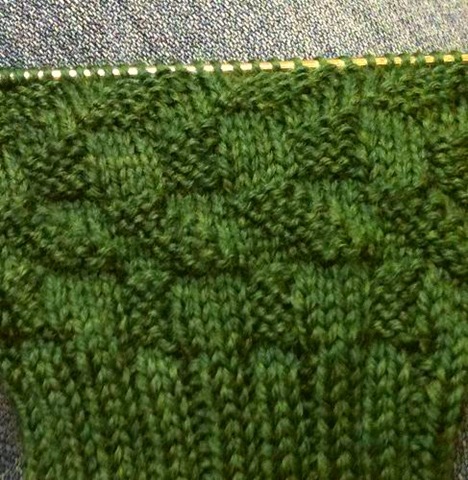 I've caught myself counting the rows of 2x2 ribbing several times already... but it doesn't Matter how many rows of ribbing I do now as long as it reaches the 2 inches mark! Freeing isn't it? 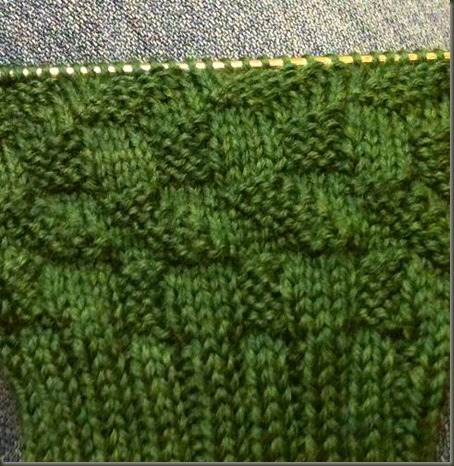 Loch Ness Socks... Cuffs - Knit 2-at-a-time on Circs!